Damp is very common in UK homes and can have all kinds of affects, including causing mould on walls and furniture or making timber window frames rot. Damp also encourages the growth of mould and mites which can be bad for your health. The mould fungi have been identified as the source of many health problems, including infections, asthma, allergies and sinusitis. Moulds produce allergens, irritants, and in some cases, toxins that may cause allergic reactions in humans. While some damp is caused by a problem with the building itself, many cases are caused by condensation. Knowing the cause of the problem will help determine what needs to be done and by whom. Get repairs for your boiler ! 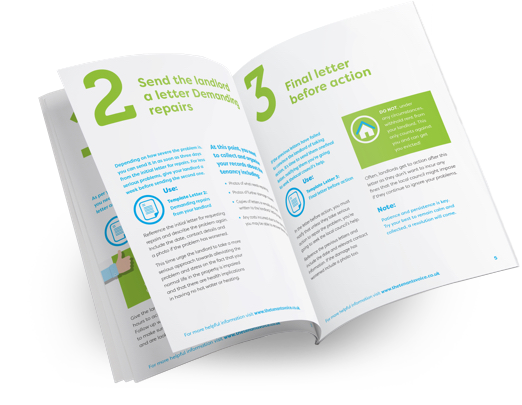 Download the full eGuide and get FREE sample letters and resources to help you get repairs to your heating and hot water systems. Damp and condensation problems are the most commonly found issues in the British households. More than a third of all households (37%) report they have condensation issues. Damp in the property creates a thriving environment for the growth and of mould. In fact, households reporting mould are only slightly less (24%) than those reporting condensation problems. Mould and damp look horrible, stand out easily, smell terribly and pose a health threat after long term exposure. It can ruin an otherwise great property in the eyes of any visitor. Mould is particularly hated because if you don’t clean ALL OF IT, it will always spread back in just a few weeks. Mould is not a severe health hazard, however, it’s a scientific fact that it can harm your health. 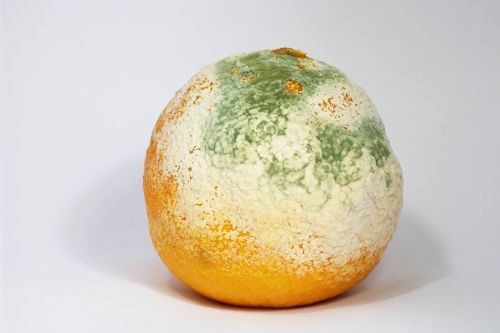 The mould fungi have been identified as the source of many health problems. The fungi can be inhaled and cause problems with the respiratory system and lungs. Common conditions include infections, asthma, allergies and sinusitis. Moulds produce allergens, irritants, and in some cases, toxins that may cause reactions in humans. The Landlord and Tenant Act 1985 makes your landlord responsible for repairing the structure and exterior of your home. The Housing Act 2004 makes it clear that ‘the structure and exterior of the property’ includes all outside walls, roof, external doors and windows. Mould falls into the interior category. Interior repairs are often left to the landlord’s discretion. Exceptions are made when the interior of the property is dangerous to it’s inhabitants. While mould is harmful, it’s far from dangerous, and making your landlord do repair work in that direction can be difficult. Mould is caused by high humidity in the property. Humidity is not damage itself, it’s the result of damage to the property. Depending on what caused the mould you landlord might be responsible for its repairs. If water gets in through the exterior it will cause the space in the walls to soak up and cause the appearance of mould. If any of the pipes are leaking water into the property, it’s only expected to have problems with damp and mould. Removing these problems will likely stop water from entering the property and causing damp. After all the mould is cleaned and the property repaired, it should stop spreading. Most often condensation and mould is a byproduct of the tenant’s activities in the property. Many of the things we do in our daily routine produce steam or heat variances that cause condensation to accumulate in certain areas of the property. Once condensation settles on the surfaces, the water droplets soak inside. Repeated exposures can kickstart mould growing on the surface. It’s very important to allow enough ventilation through the property. This is especially when you’re voluntarily causing rising damp. Hot steamy showers cause both a lot of heat and a lot of vapor. If you don’t leave the door open after you used the bathroom, all this steam will condense on the walls and provide a great environment for mould to grow. If you cook on the stove and don’t turn on the extractor or open the nearby window, all the vapors from the cookpot will settle on the bottom of the kitchen cabinets or the ceiling above. If you dry clothes in the room, or on the radiators, all the water will evaporate in the room. Unless there is a way for it to escape, it will get absorbed by the walls and furniture. Doing this for a few months will start causing mould to appear. Your furniture needs air circulation as well. Ventilate cupboards and wardrobes by opening the doors for thirty minutes. Leave space between the backs of wardrobes and the wall. Where possible, position wardrobes and furniture against internal walls, i.e. walls which have a room on both sides, rather than against outside walls. Bad heating through the property causes condensation and can allow for mould to grow in some parts of the property. During the cold months, heating must be somewhat even throughout all the rooms. If you only heat the bedroom, while the kitchen stays unheated the temperature difference will produce condensation in the unheated room and mould will start to appear. Set the radiators or central heating system to work all the time and only provide slight background heating. This will be enough to keep the room warm enough to prevent condensation. The golden rule when cleaning mould is to either clean all of it, or not clean it at all. Don’t forget that it’s a living organism. Unless you remove all of it, it will simply grow back and make your labour meaningless. Mix your cleaning solution. You need to get some standard bleach and mix with hot water in a 1:4 ratio (1 part bleach, 4 parts water). Get a hard brush and scrub until the coloration of the patch disappears. Apply the solution multiple times if needed. To prevent damp from settling in, tenants can purchase an electric dehumidifier. It will collect water from the air in the room into a tank, which you can empty in the sink or toilet. Just plug it and leave it working near the place from most of the damp is generated. You can try to arrange for the landlord to pay for this equipment and become part of the rented property. However, do not get your hopes high for this to happen. To effectively combat mould, tenants really need to be proactive and start the battle as soon as the first signs appear. If you leave it to spread and settle in, you might find it hard to completely cure the problem afterwards. Clothes, toys and soft furnishings that have grown mould need to be collected and dry cleaned for complete removal. Otherwise, they should be thrown away as they might infect other textile as well. Other soft furniture might need to be washed to remove the spores. In these cases, it’s best to purchase a carpet and upholstery cleaning service. These services make use of special steam cleaning equipment which fully sterilises the upholstery and removes all spores of mould. Use our tenant service directory to find recommended service providers. If the mould was a result of a damage to the exterior and the property is being renovated, it’s a good idea to buy some anti-mould paint. After the repairs have been made and the patch cleaned (using the method above), paint the spot over with anti-mould paint. It will seal the patch and prevent spores from reproducing. As a daily routine, tenants can wipe the window seals. Condensation usually accumulates mostly on the windows. Therefore, wiping the excess moisture daily will prevent them from getting mouldy. If you have made a formal report regarding damp in your home but your landlord refuses to take action there are steps you can take. Begin by collecting evidence of any damage to your property or the impact on your health. Such evidence are letters, emails, photographs with dates, receipts of damaged goods, receipts of cleaning/decorating products used to rectify the problem, doctor’s notes and hospital reports. If there is a defect in the structure, the covenants relating to repairs contained within the law do not cover these defects and the only recourse is to contact your local council. Arrange for someone to inspect the property citing the “Housing Health and Safety Rating System”. If the problem is considered to be of sufficient gravity, the Local Authority can order remedial works to be carried out. They will serve your landlord with an improvement notice. If the cause of the damp is due to structural damage because your landlord didn’t comply with the law, then you can make a formal complaint. You also have the right to commence court proceedings against the landlord and seek both compensation and an order for the repairs done. As always, seek legal advice from a regulated professional. We advise all tenants to act respectfully with their landlords and letting agents and seek a peaceful resolution to problems with their rented property. For more information, explore the articles in our Repairs and safety category. Get 10% Off handyman services by Fantastic Services ! Get help with fixing window frames, installing sealants and fixing mould and damp issues. Use The Tenants Voice code FTTV10 at checkout to get 10% off the price !